One thing I love about living in a large city is it so easy to try and learn about new things. We definitely make an effort to try dates outside of just the movies to keep it fresh and interesting. Two ways we've been able to do this on the dime are Groupon and giveaways! I love entering giveaways on Twitter. If you follow our cultural hubs such as the art museums and theatres in Dallas on Twitter you'll find that they often have extra passes to events in the city that they are willing to give out for free on Twitter for a simple RT or repsonse. Sometimes that isn't even necessary - a few weeks ago I tweeted at KXT radio that I was enjoying their playlist that day and they gifted me with the new Black Keys CD just for reaching out! 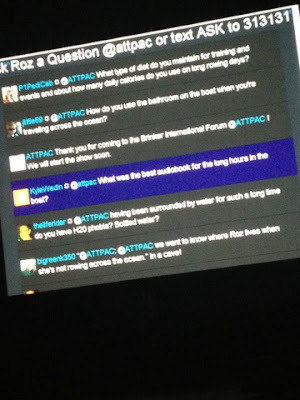 Last week the Dallas Arts District hosted a Twitter giveaway for two tickets to see Roz Savage speak at the Winspear. I blindly entered just for the fun of participating and was lucky enough to win two tickets to see her presentation last night. She was an engaging speaker and I learned a lot about her journey, our environment and, surprisingly, myself over the course of the evening. Roz Savage is the first woman to cross the Pacific ocean solo by rowboat. She is also the first woman to cross three oceans solo by rowboat. You may think that would mean that she had been rowing all of her life, but she actually worked a desk job for 11 years before deciding that she felt compelled to do something "big" with her life and subsequently found that rowing across oceans was her big thing! 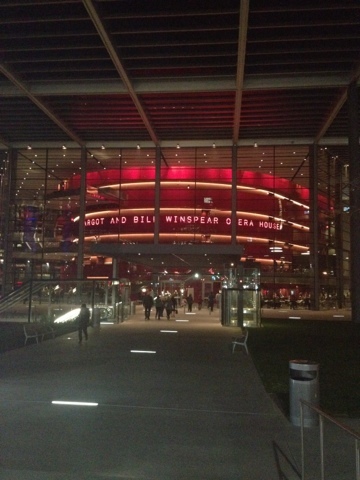 The event was held at AT&T Performing Arts Center's Winspear Opera House. It is such a gorgeous space I always love an excuse to be inside it. Our seats were amazing as well. We've never been able to sit so close at the opera house before, so thank you, Dallas Arts District for allowing us to be your guests! 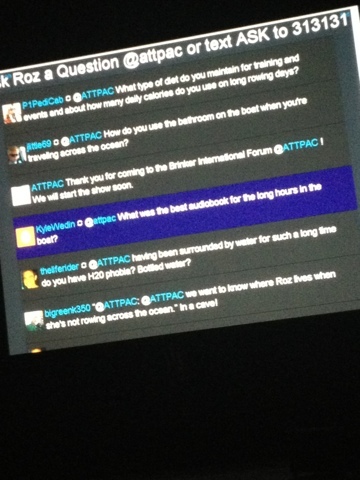 Before the presentation started you could "ask" Roz a question by submitting it through text or Twitter. You can see Markus' question at the top re: how many calories she has to consume a day while rowing and what she eats beforehand to prep. If it wasn't clear before that Markus is a "food as fuel" type of person, it was clear last night. She only answered three of the submitted questions and one was Markus'! If you're curious, she tried to gain at least 30 pounds before leaving on her rows because that is how much she typically loses - even though she consumes 4,000 calories a day when in the ocean! As an armchair environmentalist, I was the most fascinated by her viewpoints and discoveries on our Earth and its needs from us as its citizens. Roz rows the oceans to bring awareness to martime pollution and conservation. Roz has seen some incredible maritime life and, unfortunately, pollution on her travels. The videos she shared from a plastic island in the North Pacific, called the Great Pacific Garbage Patch, made a deep impression on me and it will be a long while before I use a plastic water bottle again! Roz's message about what is takes to be an environmentalist was very powerful to me. She explained that no matter who you are, protecting our world is something that has to be done "one stroke at a time." It's those conscious desicions every day to wait to throw something out until we've found a recycling bin for it, or bringing our own shopping bags to the store and using our reusable sandwhich bags or water bottles that will add up and keep plastics out of our oceans and landfills. I get a lot of crazy looks sometimes when do things like keep my papers and cans under my desk and bring them home at the end of the week, but those items are out of the garbage and there is a tiny chance that I have set an example to someone else that recycling can be easy, even if a blue bin is not tucked under your desk at work. I really appreciate that so many organizations in Dallas work to make their social media platforms a two way street with their followers. It makes me feel like a part of their missions and keeps me in the know about unique happenings in Dallas. Thanks to Dallas Arts District for the tickets and congratulations to Roz Savage for her success in finding what makes her happy and using it to save our waters! What are some ways that you like to hear about events in your city? Do you ever enter giveaways as a free way to try something new? What are some ways that you try to make a difference for our environment? Love twitter as a way to be in touch. It is the best quick read / catch up vehicle I have to keep up with sooo much that happens in Dallas.